Yo ho! Barnacle Bart is always ready for treasure hunting and adventures on the high seas! Use one hand to manipulate his mouth and facial expressions while gesturing with the removable wooden rod with the other. Detachable rod is suitable for lefties or righties! 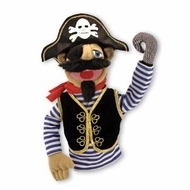 Puppet measures 11"L x 10"W x 5.5"H .
Features removable clothing and a removable hand-operating rod for extra fun! Ideal for use with our new Tabletop Puppet Theater and our Deluxe Puppet Theater!